My mother is German, our family coming originally from Eastern Germany; in fact, my maternal great great grandfather's family were from even further east in modern Poland, being a headmaster for a school in Gdansk. As a result, one of my favourite treats has always been stollen and lebkuchen which my grandmother used to send us from Lebkuchen Schmidt in Nurnburg. Everything came in gorgeous decorated tins or beautifully covered in pretty wrapping. It really was one of those magical things about my Christmases when I was young, but the mystery has gone a bit now that you can buy versions from Marks & Spencer through to Lidl, even if the quality just is not there; in the same way, Niederegger marzipan was a special treat, yet is now ubiquitous, and we used to get a 10 inch bar covered in chocolate, from which we used to cut off small slices to eat like manna. As I said earlier, ours used to come from Lebkuchen Schmidt and I have treated myself to a pack this year, so fingers crossed that will arrive by Christmas (the wonders of the world wide web and its power to connect). 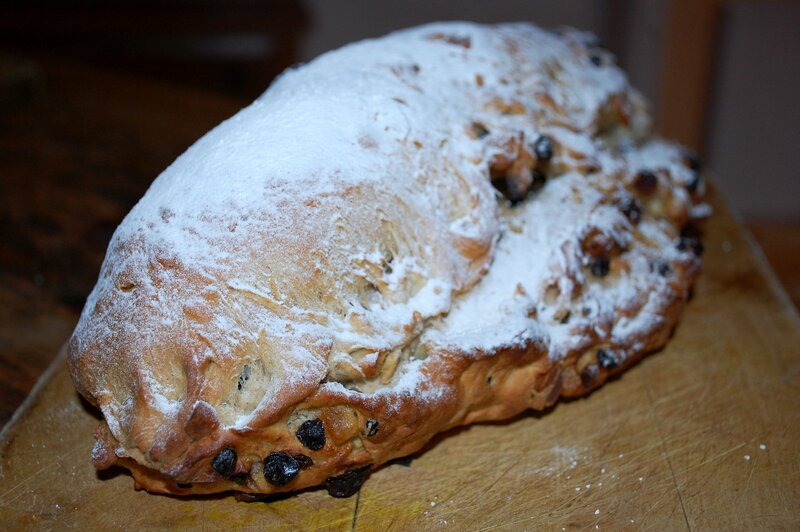 But I really felt that I could/ should have a crack at making homemade stollen as, unlike the lebkuchen, this is something (a) I ought to be able to make; (b) the treat factor in stollen is less great. For reference, I used three books: Delia Smith's "Christmas", Christine Ingram and Jennie Shapter's "Bread" and my other favourite Elisabeth Luard's "European Peasant Cookery", with "Bread" used as the key recipe. 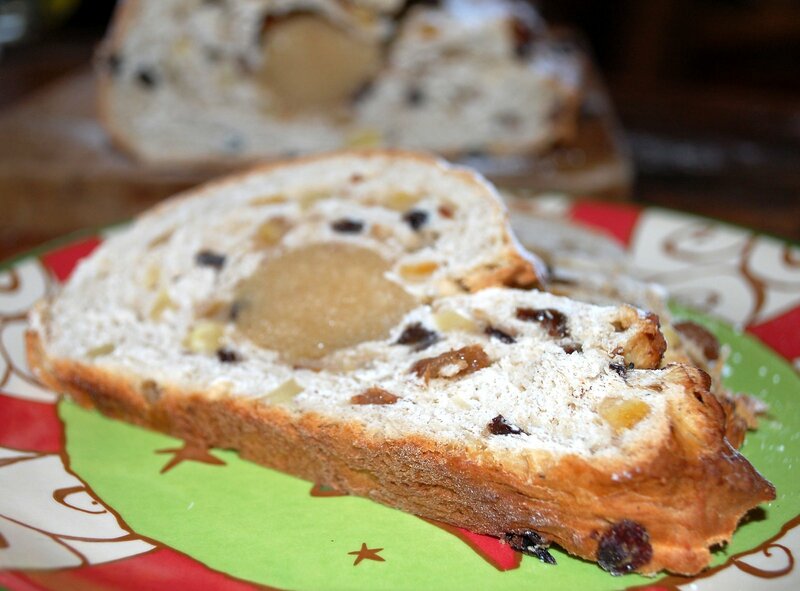 Interestingly, modern stollen (or shop bought stollen) has morphed into a relatively dry, sweet fruit cake with some marzipan in it and smothered in icing sugar (nor is it a rich fruit cake like Christmas cake or Yorkshire brack, but quite plain), which is not the real thing which should be an enriched bread; the best locally made stollen cake comes from Bettys & Taylors, which is worth treating yourself to. Weigh out the organic sultanas and currants, then sprinkle the tea over these and leave to soak up the liquid until you need them later. 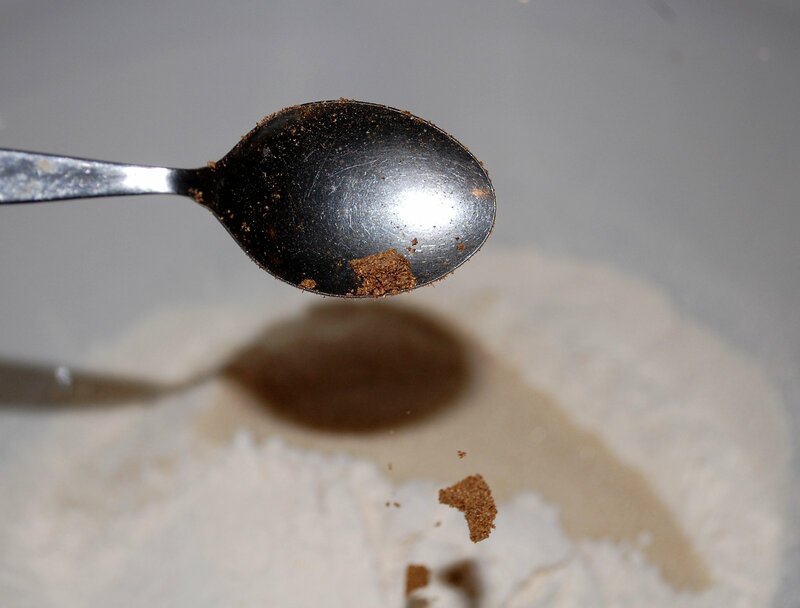 Sift the bread flour and salt together into a large bowl, then add the sugar and stollen spices and mix thoroughly together. Put the yeast into a small bowl and pour over the lukewarm milk, breaking up the yeast with a fork and mixing to a creamy emulsion. 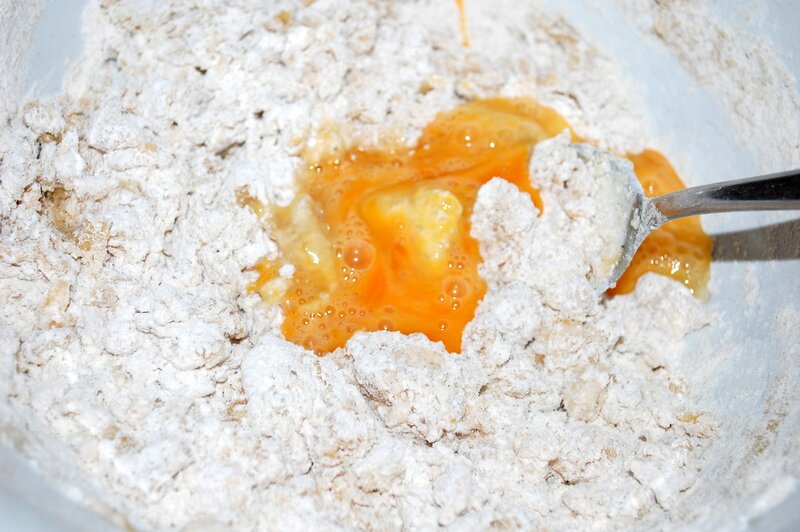 Make a well in the flour and pour the yeast mix into this and cover the liquid over with a bit of flour. Cover the bowl with some cling film and leave in a warm place for 30 minutes. This stage gets the yeast active and growing. Next, we make the rich bread batter. Add the melted butter and whisked egg and mix together to a soft dough. Tip the dough onto a lightly floured surface and knead for 10 minutes until the dough has a smooth, elastic texture. 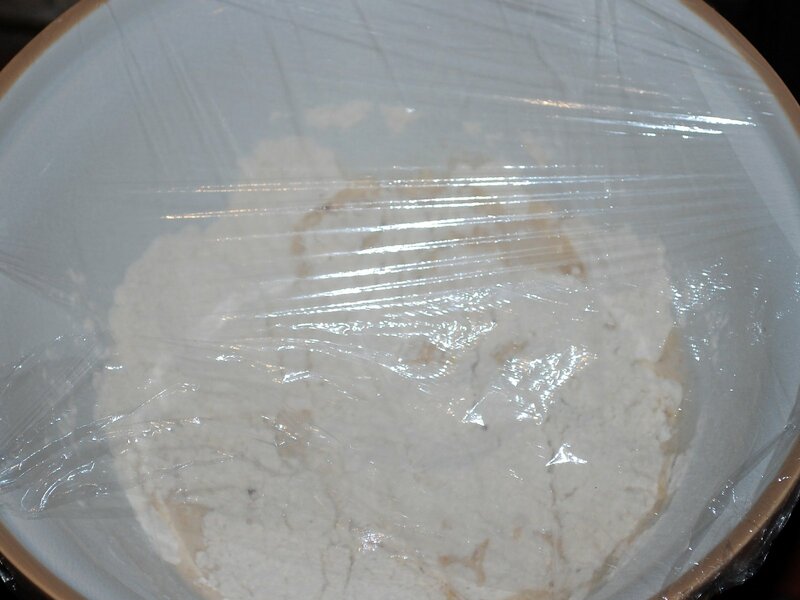 Put the dough into a lightly oiled mixing bowl, cover with clingfilm and leave in a warm place to rise. This will take 2 - 3 hours and you are after it doubling in size; I left mine close to a warm fire and it doubled in about 1 hour, but be careful about the warmth as the ideal temperature is about 37C, i.e. human body temperature - too low and it will expand slowly, but if it gets too hot, you will kill off the yeast (that is also why the milk should be tepid or touch tepid). While the dough is rising, you should make the marzipan. This is one of those mega-simple recipes where you simply mix all the ingredients together and knead to a soft, smooth paste. When made, put in the fridge until you need it. When the dough has risen sufficiently, take the marzipan out of the fridge, then tip the dough onto a lightly floured surface and punch (knock back) the risen flour. 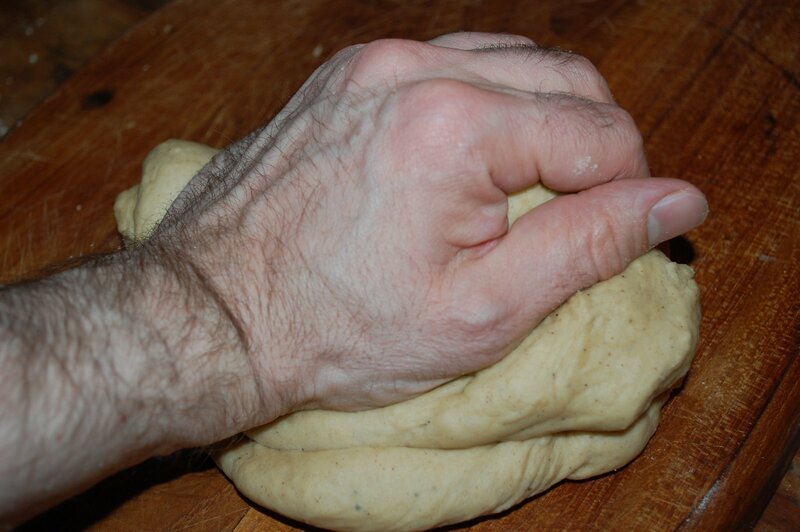 Flatten and roll the dough to 1 inch thick;. pour over the sultanas, currants, mixed peel and chopped almonds. 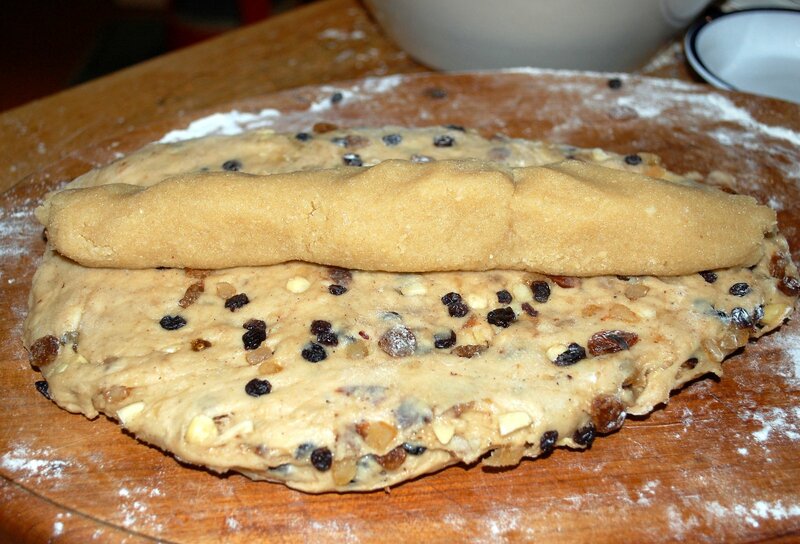 Fold over the dough and press and gently knead the dough until all the fruits have become incorporated. Now roll out the dough to an oval shape about a foot long (30 x 23cm / 12 x 9 inches), then slightly depress the centre with the rolling pin to make it thinner like a crease on a card. Roll the marzipan to a long thin sausage shape and place it into the slight depression on the dough, leaving a short space at either end. Fold over the dough, so that it covers the marzipan and gently seal the edges. Place the loaf on a prepared baking tin that has been lightly oiled and cover with some oiled clingfilm. Leave in a warm place to rise to double the volume again, which should take about 60 minutes. Preheat the oven to 200C/ 400F. 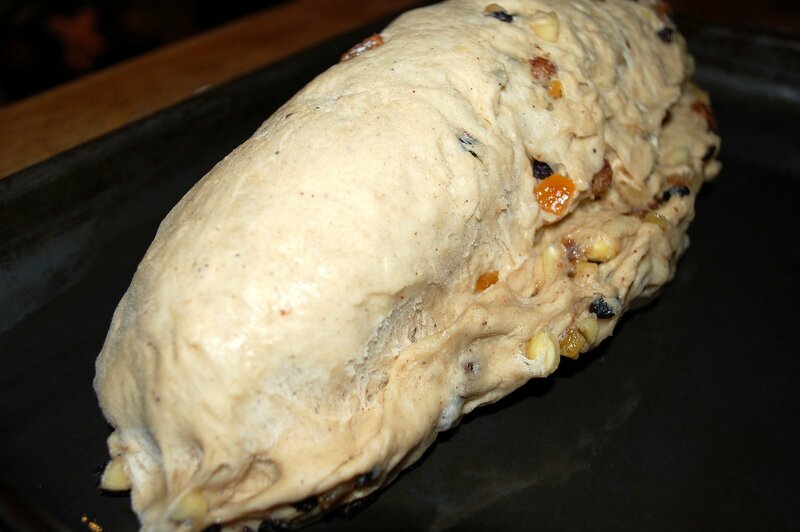 Bake the stollen loaf for about 30 minutes until it is brown and it sounds hollow when tapped. While warm, brush the surface with some melted butter and leave to cool. When cool, dust it with icing sugar.